I’ve been home for three weeks and it’s hard to re-enter what I refer to as my real life. As I do my errands, shopping at the Stop and Shop, the post office, bank, etc. I bump into people who have their own tales of woe about this past winter. Mostly they survived and seem a little shell-shocked. – not quite believing that the worst is over. I’ve decided that “How was your winter?” is not a good way to greet people. Many folks were able to get away for a brief respite from the relenting weather. What started out as a novelty, a time to hunker down and enjoy being at home, turned into “enough all ready!” by the third big storm. Coming back when it’s all over seems a bit like cheating. My property doesn’t look too bad and miracle of miracles our car started right up when we turned the key in the ignition. Now I too am embracing the spring and with it a new book launch is about to happen. This is the hard part of my work. The planning, the execution of it, is what I enjoy. Promoting a book, planning talks and coordinating book signings is harder. All my writer friends agree. We are used to being behind the scenes. We are cowardly, hiding behind our names printed on the jacket of our books. Coming out, so to speak, is a bit harder. Talking about a book is always fun because it’s a chance to share the experience of how it was created, and a chance to relive that experience. I’ll be sitting at a table for the Nantucket Book Festival on June 20. On the 19th at 2:00 in the library park I’ll be talking about how this particular book came about.. Producing a book is an exciting project and, I am often asked how I find the houses for my style books and how we go about planning the photographs and interviews and all the behind the scenes tidbits. In July Terry and I will present a slide show in the Great Hall. Two of the articles featured in the first two issues of Nantucket Today magazine are on cottages included in the book. 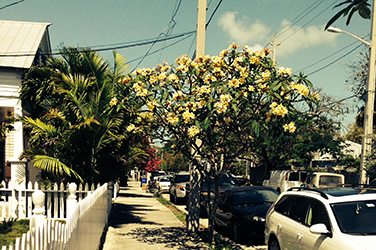 While it seems like an oxymoron, the cottages demonstrate that downsizing can be upscale. If you are sprucing up your home for the season, looking for a new look, or furnishing a new home here are some ideas for elegant living small from the book, “Nantucket Cottages & Gardens”. 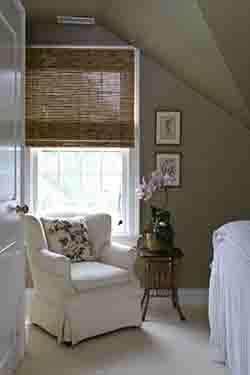 The ideas focus on small areas but can be adapted to any size house. 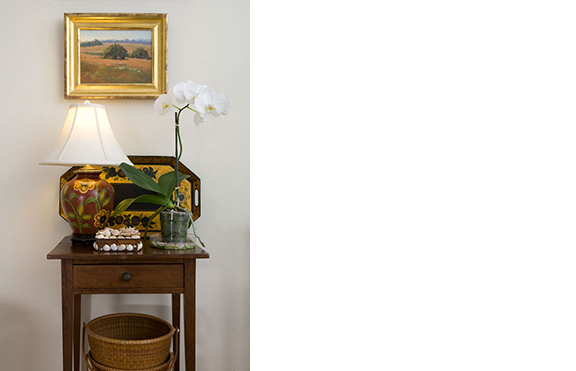 Rather than spread art and collectibles around a room, arrange them in one vignette as if for a photograph. A narrow wall? Create a scene with a few related objects on a table. They might be similar colors, shapes or textures. See photo #1. The painting reflects the colors in the tray, lamp and basket. There’s a combination of sizes and shapes as well as texture and height – some low items, a delicate orchid for height. Notice the painting is not centered but lines up with the left edge of the table. Orchid to match the subtle lilac color in the pillow fabric for a feminine touch. A greige color wall paint adds sophistication paired with stark white. One good folk art piece immediately says “cottage style” and offers a practical storage solution as well as a way to display art objects with things you use. It’s important that objects of art are also useful such as the Lightship basket holding a plant that can, from time to time, be used as a centerpiece. The crock holds cut flowers at times. 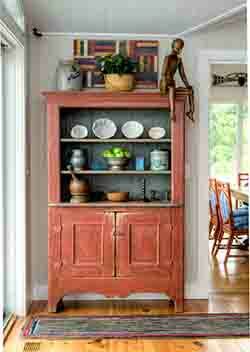 But the hutch makes a nice statement and creates visual interest from floor to ceiling. A good way to visually separate living areas in an open floor plan. Look for areas to utilize for built-in storage. A narrow recessed area, for example might become a bookcase or a wine cooler with clear glass shelves for a mini bar area. Look for spaces to repurpose for practical use.